Dr. Shaun C. Williams is a Partner in Reproductive Endocrinology at Reproductive Medicine Associates of Connecticut (RMACT) and is board-certified in both Obstetrics & Gynecology and Reproductive Endocrinology and Infertility. As every doctor knows, education is the key to success. For Dr. Shaun Williams, this is true not just for himself or his career, but also for his patients. Dr. Williams’s personal story started with education at an early age under the guidance of his grandmother, Dotti, in Texas. She was from a generation that valued the medical profession second to none, and she encouraged young Shaun’s interest in science by bringing him with her to work at a radiology office. Later he would work in this same clinic during college. Dr. Williams earned his undergraduate degree from University of Texas at Austin and went on to study medicine at Baylor College of Medicine in Houston, Texas, where he was part of the Alpha Omega Alpha Honor Medical Society. He conducted his internship and residency at The University of Texas Southwestern Medical Center, where he received the Berlex Labs Resident Teaching Awards. He completed a residency at Parkland Hospital, one of the busiest maternity wards in the country with 15,000 babies delivered each year. Dr. Williams was drawn to infertility, a challenging field that is constantly changing and advancing. In particular, he has an interest in prevention of genetic disorders. He did a fellowship in reproductive endocrinology and infertility at The Jones Institute for Reproductive Medicine at Eastern Virginia Medical School. This esteemed institution was one of the first pioneers in the infertility field and continues to provide cutting edge training for future infertility specialists. 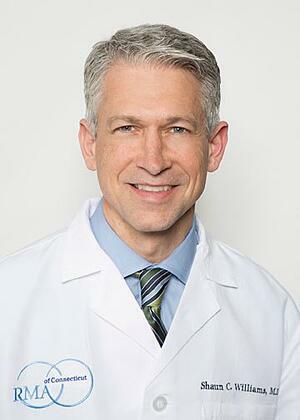 Before moving to Connecticut, Dr. Williams practiced with Pacific Gynecology Specialists in Seattle, Washington and was an associate clinical instructor in the Department of OB/GYN at University of Washington. He is now a partner at Reproductive Endocrinology at Reproductive Medicine Associates of Connecticut (RMACT) and is board-certified in both Obstetrics & Gynecology and Reproductive Endocrinology and Infertility. Dr. Williams has been published numerous times, and has presented five of his abstracts at American Society of Reproductive Medicine’s (ASRM) annual conference for professionals in the infertility field. He has numerous accolades, including being named a “Top Doctor,” “Most Compassionate Doctor” and “Best Doctor in America.” He is a member of ASRM, Fairfield County Medical Association, Fellow of American College of Obstetrics and Gynecology, and associate member of Society for Reproductive Endocrinology and Infertility. In 2018, Dr. Williams was reappointed to Assistant Professor at St. Vincent's Medical Center in the Department of OB/GYN of the Frank H. Netter MD School of Medicine at Quinnipiac University. Outside of the office, Dr. Williams has been a life-long athlete. While he no longer plays football (he was the high school quarterback), he continues to play soccer in a 40+ men’s league despite the liability of broken ribs and numerous bruises. He also enjoys traveling, especially to Spanish-speaking countries where he can practice his second language. More than anything, Dr. Williams enjoys spending time with his wife and his three children. Contact us to book an appointment with RMACT lead infertility specialist Dr. Williams in our Connecticut or New York fertility centers.